The Edible Pudding Slime Recipe That Smells AMAZING! Home » Slime Recipes » The Edible Pudding Slime Recipe That Smells AMAZING! 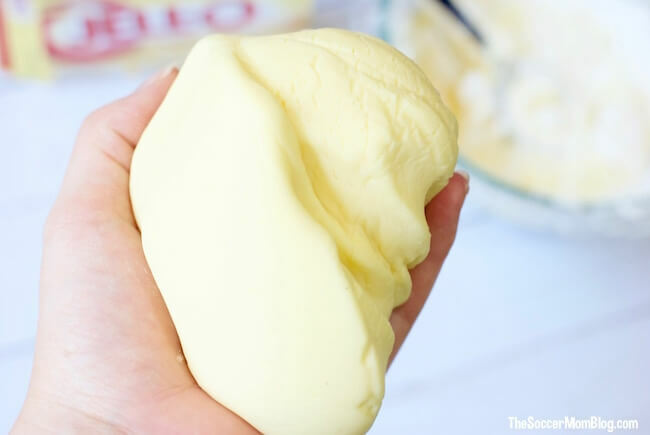 A soothing cross between slime and play dough, this edible pudding slime recipe smells almost good enough to eat! (And it’s taste-safe!) Our most popular edible slime of ALL time! But what do you do on a day you’re craving some squishy slime sensory play, and don’t have the usual ingredients? Make a new recipe of course!! Today we dug some old boxes of instant pudding out of the back of our pantry — who knows how long they’ve been there, so might as well get some use out of them! The result was a fantastic-smelling hybrid between slime and play dough. We even tried a couple different flavors and made a banana split! Because more slime = more fun! 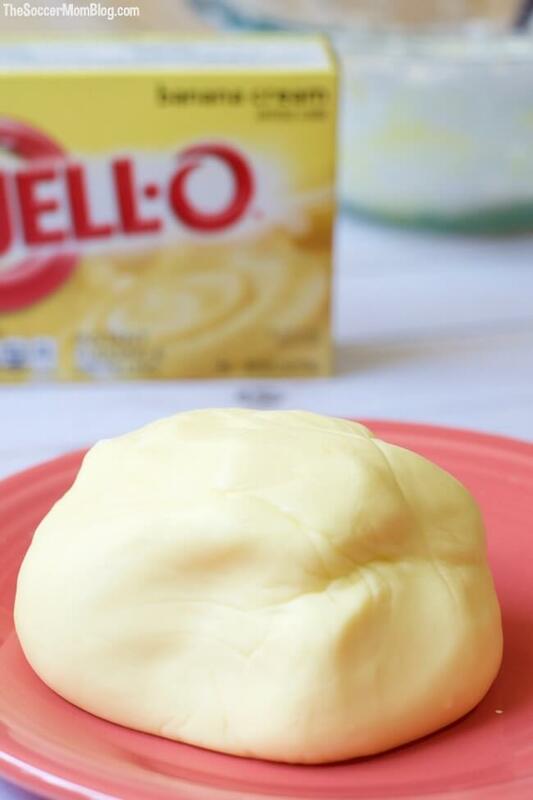 The best part is that this pudding slime recipe is made with all food ingredients, so if your kiddo sneaks a taste it’s not a big deal. Related: Get 30+ unique slime recipes in one place! 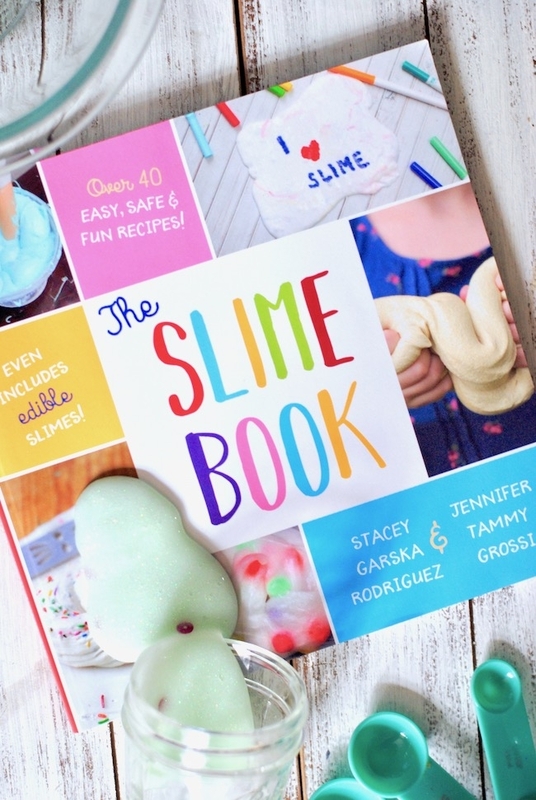 Grab your copy of The Slime Book today! This recipe rocks because you only need 3 simple ingredients that you might already have in your kitchen! I’ve included affiliate links for your convenience; disclosure policy here. Tip: If your kids love making edible slime, stock up on corn starch! It’s one of the safe slime ingredients we use ALL the time! Check out our easy demo video how to make pudding slime! Slowly add the rest of your cornstarch, stirring as you go. When slime thickens and is hard to stir with a spoon, finish kneading by hand. Tip: Making slime isn’t an exact science, and sometimes I need to add a bit more water if the slime is dry, or a bit more corn starch if it is sticky. I’d compare it to making bread: sometimes you need to keep working in flour until you have the perfect consistency. Note: Keep in mind that this edible Jello slime won’t behave exactly like stretchy glue/borax slime, as they have different properties and react differently. However, I feel that safety aspect of an edible slime is well worth the trade, especially with younger children. There are three starter slime recipes that form the base for hundreds of awesome slime variations, like this Edible Pudding Slime. Once you master these basic recipes, you can make almost anything! While this pudding slime recipe is technically edible, it’s not meant to be consumed as food. Always supervise kids when playing with slime, even taste-safe slime. Add a couple drops of pink food coloring to one batch of banana pudding slime and knead until it turns a light pink. This is the “strawberry” scoop. Easy clean-up: Discard slime when done playing (or you may be able to keep covered in the fridge for a day or two and re-hydrate with water), and simply wash hands and play area with soap and water. Related: Be sure to try our most-viral slime recipe! 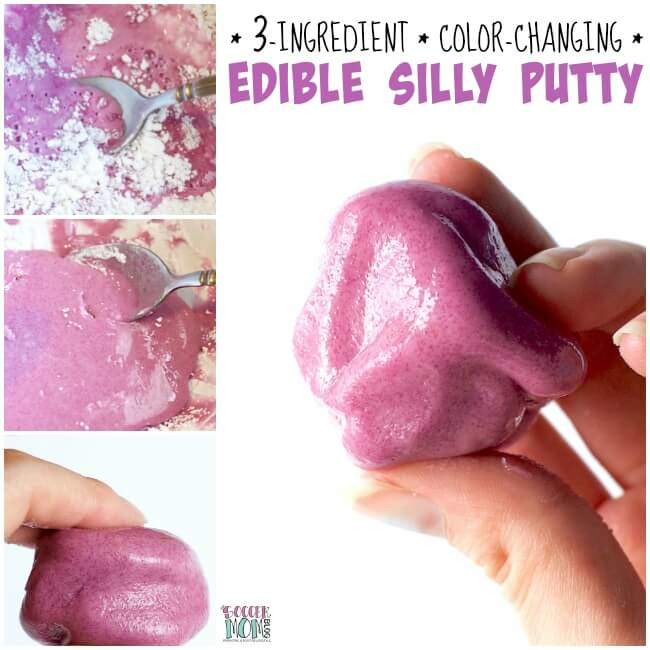 This “magic” color-changing silly putty is taste-safe and only requires 3 simple ingredients. Stacey, So after playing with the pudding slime I have to throw it away the same day? Smells amazing. I toss it after we’ve played with it all day – don’t want to take a chance of harboring germs from little hands 😉 I think this is one of my favorite smelling slimes too! So, has anyone tried baking this? I’m wondering if the children could make things with it, then be able to keep them as hardened items… like when you make ornaments or pendants out of play dough or salt dough. I’m tempting to experiment myself but don’t want to blow up my oven! I loved your post so much I included it in an edible slime round up. Hopefully, I’ll be sending you a bit of traffic as a result. Keep up the good work! I can not wait to try this with my boys! I love all of your slime recipes. They are all so creative. Thank you! Glad you enjoy our slimes! Hi, how long does the edible pudding slime last? Hi Jennifer – since it is made with food ingredients, I would discard after 1-2 uses. If you wash hands before play, you may be able to keep for a couple days in the fridge in an airtight container. Simply knead in a bit of warm water to re-hydrate. Always check for signs of mold just in case before re-using (since it is moist and food-based). That is an awesome safe SLIME recipe. I think that it might be cool to add sprinkles or other different colors. 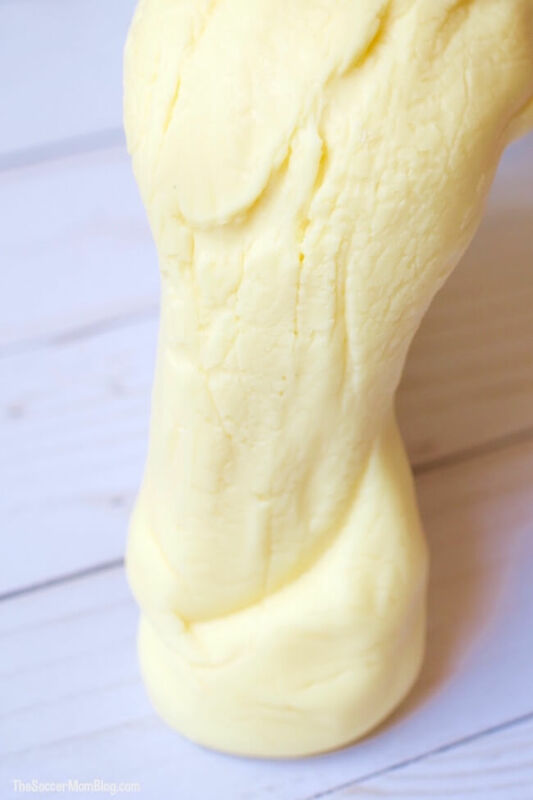 This Slime recipe is very similar to an edible play dough recipe that i tried years ago using powder milk. Thanks for the great idea and awesome post! Glad you loved it! Sprinkles are one of our favorite add-ins for our edible slime recipes too!